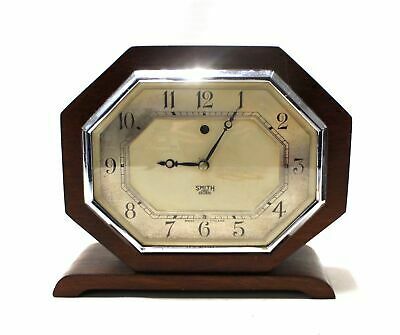 Seller: bhf_shops (239,595) 99.2%, Location: Leeds, Ships to: Worldwide, Item: 372631793726 Vintage SMITH Sectric Octagonal Wood & Bakelite Early Electric CLOCK Item SpecificsApproximate Measurements - 16cm in height and 18cm in width Item Condition The clock is in a fair used condition and does not seem to be in working order. There is minor age related discolouration to the face. Would benefit from a clean. Customer ServicePlease do contact us with any questions you have relating to this item. Our dedicated customer service team operate from 9am - 5pm Monday . Friday and we will respond to your query within 48 hours between these operating times. Payment & DeliveryWe ask that payment is made within 8 days of the auction ending via PayPal.We will despatch items within 48 hours of receiving payment via the shipping method outlined on your invoice. Support the British Heart Foundation's life saving researchAs the UK's number one heart charity, the cutting edge research we fund has already made a big difference to people's lives. Every penny you spend or donate with us takes us closer to beating heart disease for good. Condition: Used, Condition: The clock is in a fair used condition and does not seem to be in working order. There is minor age related discolouration to the face. Would benefit from a clean. Popularity - 258 views, 6.8 views per day, 38 days on eBay. Super high amount of views. 1 sold, 0 available. High amount of bids. 258 views, 6.8 views per day, 38 days on eBay. Super high amount of views. 1 sold, 0 available. High amount of bids. Seller - 239,595+ items sold. 0.8% negative feedback. Great seller with very good positive feedback and over 50 ratings. 239,595+ items sold. 0.8% negative feedback. Great seller with very good positive feedback and over 50 ratings.